ACARS Aircraft Monitoring on VHF Band with Radio Scanner and Personal Computer. All commercial Aircraft use ACARS on VHF for data TX/RX to ground stations worldwide. The frequencies used are different for various continents so you need to RX on the correct frequency in the VHF Band on AM Amplitude Modulation with NO Squelch on. Australia uses 131.550 AM and the coverage can be up to 500 miles with good conditions on VHF considering the aircraft can be at 35000 + feet. n2uhc describes the acars operation below better than I could so is presented below as the original website is defunct. ACARS, or Aircraft Communications Addressing & Reporting System, is a VHF Band AM Signal in digital mode bursts known as “Squitters” for civilian and military aircraft to report various in flight information. The ACARS system is used to free up some of the duties of the flight crew as many functions are automated with?occasional?TX of data “Squitters” indicating location of?the aircraft by Latitude & Longitude. This location is decoded and displayed on the Wacars graphic map display as shown below. 131.550 appears to be the most commonly used frequency in North America, however, in my location in Kansas I seem to get more traffic on 130.025. The busiest frequency may vary at your location. There are numerous programs out there for decoding ACARS. The program I use is WACARS, a freeware program available on the internet by downloading?below. ?The program uses the sound card to decode the ACARS signal into readable text. ACARS data is all encoded in order to keep the transmissions short. The program automatically decodes the hard-to-read ACARS text into more-or-less plain language. Another neat function of WACARS is a mapping feature that will display the position of aircraft when they send position reports. The map that comes with the program is for the London, England area. The map is a standard Windows bitmap file, so you can either download a map for your own location and save it as a bitmap or draw one. There are many websites that have maps for use with Wacars, however, most of them are maps of Europe and have none for North America. A good website to generate your own map can be found at?http://woodshole.er.usgs.gov/mapit/. Just enter in the coordinates you wish for the map (the same coordinates you can enter into the Wacars program) and this site will generate a map for you. ACARS is monitored by taking the audio output from the scanner and feeding it into the line input of a computer soundcard. This can be done with a patch cord with a 3.5 mm headphone jack at both end. It’s best to use a?1:1 audio transfomer?between the scanner & soundcard. This isolates the soundcard from the scanner so that static charges won’t fry the soundcard. Any scanner can be used provided it receives the above frequencies, as most scanners do. A dedicated VHF aircraft receiver can be used as well. Better results may be had by tapping the discrimator circuit of the scanner, but I’ve found that this isn’t necessary with WACARS. To monitor ACARS with a scanner, since the data bursts are so quick, it’s a good idea to leave the scanner on one channel with the squelch wide open. By doing this, you will hear everything on that channel. However, some monitors have had success scanning all the ACARS frequencies; however, you need a scanner with a quickly-opening squelch, or else most of the data will not be decoded. You will miss some traffic but will be able to monitor each channel. You will need to experiment with your scanner to see if the squelch opens quickly enough to work in this way. If you do decide to leave the scanner on one frequency though, leave the squelch open. I monitor using this method and get a lot of traffic throughout the day. 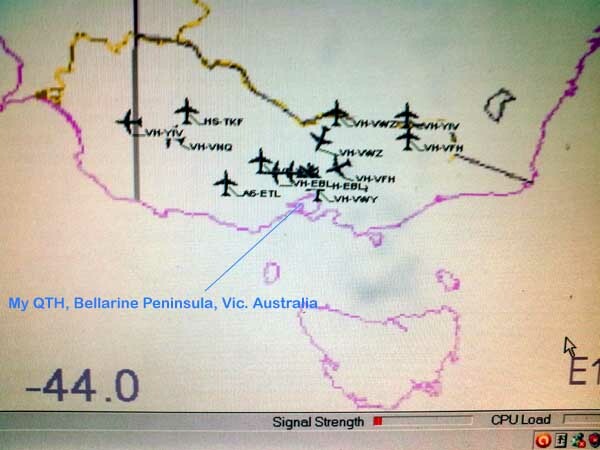 The image below is of a reception of aircraft right across the state of Victoria to South Australia in the West, up to New South Wales in the North by hundreds of miles from my QTH. CQDX11.com Updated Victoria Australia Locations with Latitude and Longitude? WDF files also updated Australian Aircraft information. Choice of different MAPS suitable to South East Australia region. Official WACARS site was here but no longer.. This entry was posted in ACARS Aircraft Monitoring, CB-Radio-Hobby by 43AX05. Bookmark the permalink.